The EU Commission recently agreed Council Regulation 559 that sets out fishing opportunities and fish quotas for EU fishing fleets, and also sets out new rules for recreational bass fishing throughout northern Europe, including Ireland. Implementation of this regulation will require new legislation in Ireland. In the interim period, pending legislation, Inland Fisheries Ireland(IFI) is requesting anglers to recognise the need for conservation and to fish according to the regulations that are expected to be introduced shortly i.e. to fish on a catch-and-release basis up to and including June 30th, 2016. A one fish bag limit will apply from July 1 to December 31. It is envisaged that the introduction of new legislation for Ireland will incorporate elements of the National Bass Policy and will be introduced in advance of the close season for bass angling. The new EU regulation on bass fishing was introduced as an emergency measure to address declining bass stocks, as scientific advice indicates that stocks in northern Europe are in a perilous state. Dr Ciaran Byrne, CEO of IFI stated ‘ Bass is a valuable and important sport angling species which has been managed as an angling species since 1990. It is a valuable resource,contributing €71 million to the Irish economy annually and supporting over 1,200 jobs. The new measures here and restrictions on commercial fishing outside Irish waters will help improve bass stocks and ensure they continue to provide quality angling for local and tourist anglers alike into the future, sustaining and growing the important economic and social benefits’. While there is no commercial fishing for bass in Ireland, commercial fishing elsewhere has been severely curtailed, particularly on spawning stocks, which should help Irish stocks. New measures for recreational angling are also being imposed on an international level. 500 euro and the perpetual cup for biggest cod, match prizes too. Further details later, but stick it in your diaries! 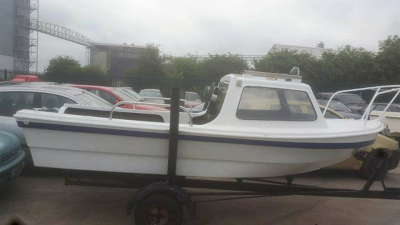 As part of an ongoing investigation into the theft of boat engines, Gardaí in Portlaoise carried out three searches in the town on the 24th and 25th of June.